Bridalveil falls in Yosemite National Park on a rainy day, in late Spring when snow melt causes the falls to surge, with trees visible in the foreground, Yosemite Valley, California, 2016. Yosemite National Park officials has canceled camping reservations this weekend because of a major storm expected to hit Northern California. Park officials said the warm Pacific storm is expected to have a significant effect on the park and surrounding areas since Friday. Roadways, campgrounds and other facilities could be affected. 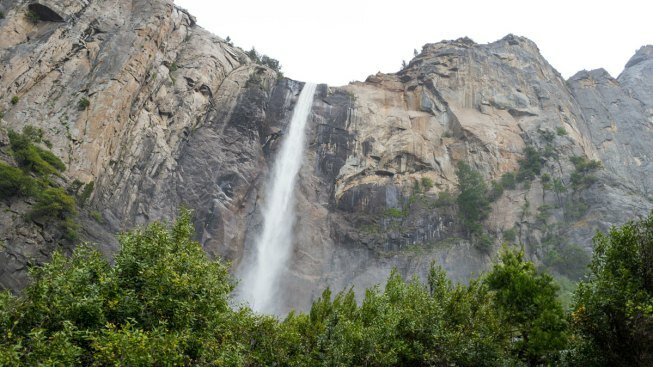 The National Weather Service has issued a flood watch for the Yosemite area from 11 p.m. Friday through 11 a.m. Sunday. The so-called atmospheric river has triggered a series of flood watches and warnings into the weekend, particularly for burn-scarred areas of Northern California wine country. The Department of Water Resources is also monitoring the Oroville Dam, where the partially rebuilt spillway may be used for the first time since its near-collapse in February 2017.